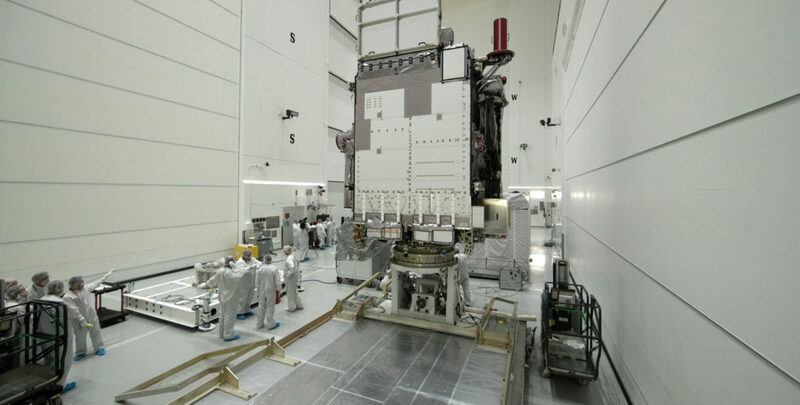 Technicians and engineers at the Astrotech Space Operations payload processing facility have placed NOAA’s GOES-S satellite on a work stand to begin routine but critical preflight inspections, tests and checkouts. 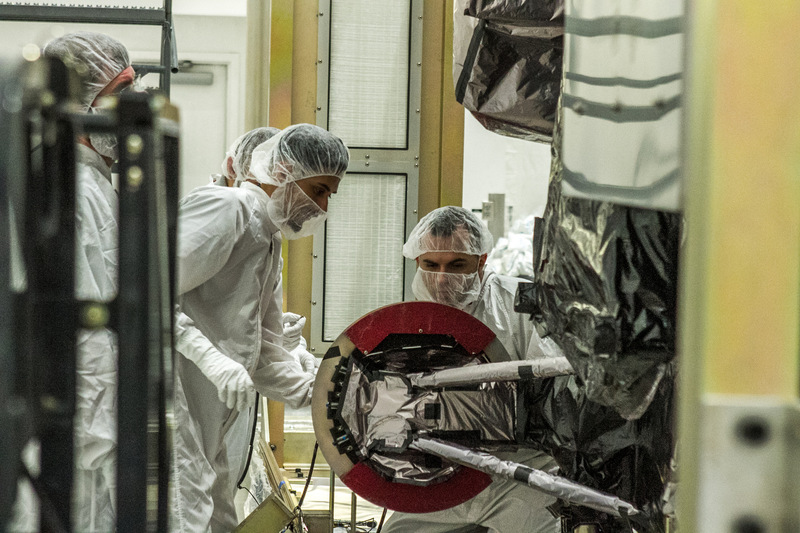 These processing milestones will ensure the spacecraft is ready to withstand the rigors of launch and take its place as the second in a new generation of advanced geostationary weather satellites. The satellite arrived Dec. 4 at NASA’s Kennedy Space Center aboard a U.S. Air Force C-5M Super Galaxy cargo transport aircraft and was offloaded the following morning (right). It was then transported to the Astrotech facility, located in nearby Titusville, Florida, to begin processing. Inside the Astrotech high bay, team members carefully removed the shipping container, inspected the satellite (below) and placed it into a workstand (above) for prelaunch work to begin. The next satellite in line to join NOAA’s environment-monitoring network is one significant step closer to launch following its delivery Monday to NASA’s Kennedy Space Center in Florida. 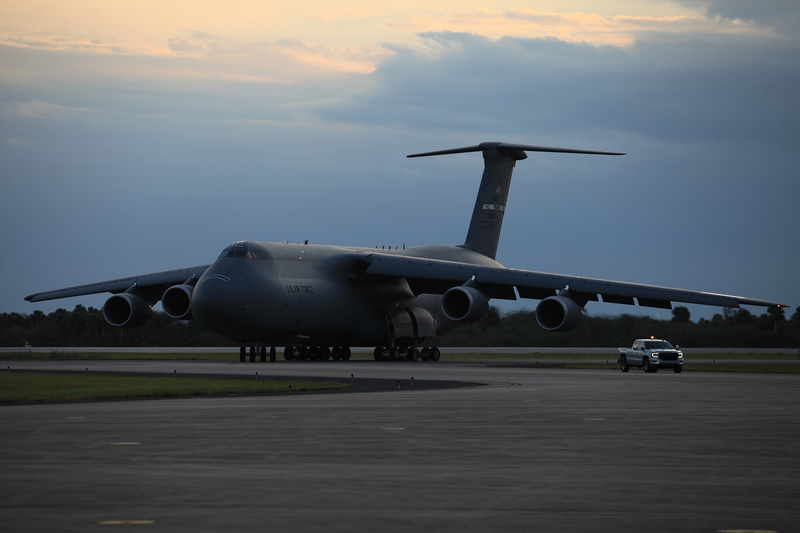 Geostationary Operational Environmental Satellite-S (GOES-S) arrived at the Florida spaceport aboard a U.S. Air Force C-5M Super Galaxy cargo transport aircraft which touched down on Kennedy’s Shuttle Landing Facility runway Monday evening. 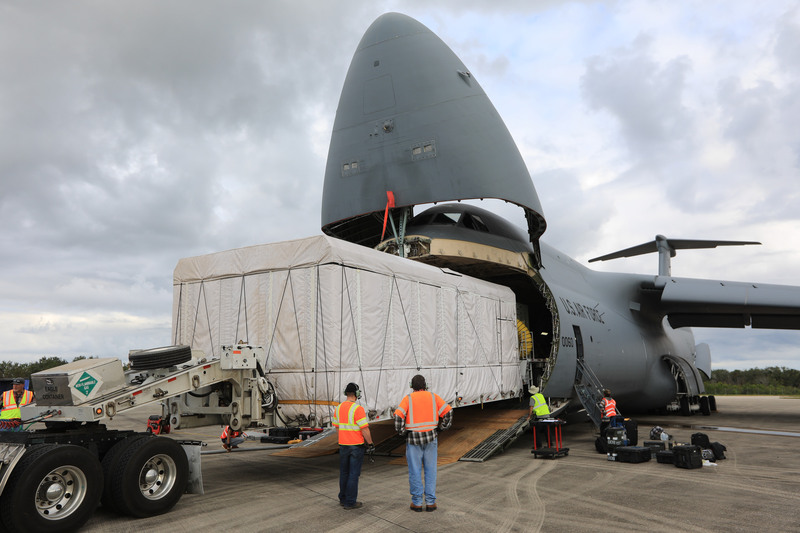 The satellite will be offloaded today and transported to the Astrotech payload processing facility in nearby Titusville, where it will spend the next several weeks undergoing final preparations, tests and checkouts for liftoff. Launch is planned for March 1, 2018 aboard a United Launch Alliance Atlas V rocket from Cape Canaveral Air Force Station’s Space Launch Complex 41. The Geostationary Operation Environmental Satellite-S (GOES-S) is the second in a series of four advanced geostationary weather satellites. 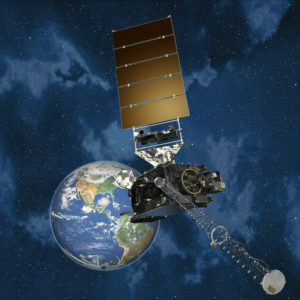 The GOES-R Series – consisting of the GOES-R, GOES-S, GOES-T and GOES-U spacecraft – significantly improves the detection and observation of environmental phenomena that directly affect public safety, protection of property and our nation’s economic health and prosperity. The satellites provide advanced imaging with increased spatial resolution and faster coverage for more accurate forecasts, real-time mapping of lightning activity, and improved monitoring of solar activity and space weather. The GOES-R Series will extend the availability of the operational GOES satellite system through 2036. GOES-S is slated to launch March 1, 2018 aboard a United Launch Alliance Atlas V rocket from Cape Canaveral Air Force Station in Florida.